When Jiddu Krishnamurti died, Osho expressed his thoughts on him as a being and his work. Its relevance, its longevity and its usefulness. It is worth reading. The discussion has been called “Death of the mystic, J. Krishnamurti”. His death is not a death. He knows his immortality. His death is only the death of the body. But J. Krishnamurti will go on living in the universal consciousness, forever and forever. If you hear him, if you allow him, if you open your doors to him, he is pure fire. He will burn all that is rubbish in you, all that is old in you, and he will purify you into a new human being. It is risky to allow fire into your being—rather than opening the doors, you immediately close all the doors. But entertainment is another thing. It does not change you. It does not make you more conscious; on the contrary, it helps you to remain unconscious for two, three hours, so that you can forget all your worries, concerns, anxieties—so that you can get lost in the entertainment. You can note it: as man has passed through the centuries, he has managed to create more and more entertainments, because he needs more and more to be unconscious. He is afraid of being conscious, because being conscious means to go through a metamorphosis. I was more shocked by the news than by the death. A man like J. Krishnamurti dies, and the papers don’t have space to devote to that man who for ninety years continuously has been helping humanity to be more intelligent, to be more mature. Nobody has worked so hard and so long. Just a small news article, unnoticeable—and if a politician sneezes it makes headlines. It is a real mystery. I have loved him since I have known him, and he has been very loving towards me. But we have never met; hence the relationship, the connection is something beyond words. We have not seen each other ever, but yet…perhaps we have been the two persons closest to each other in the whole world. We had a tremendous communion that needs no language, that need not be of physical presence…. You are asking me about my connection with him. It was the deepest possible connection—which needs no physical contact, which needs no linguistic communication. Not only that, once in a while I used to criticize him, he used to criticize me, and we enjoyed each other’s criticism—knowing perfectly well that the other does not mean it. Now that he is dead, I will miss him because I will not be able to criticize him; it won’t be right. It was such a joy to criticize him. He was the most intelligent man of this century, but he was not understood by people. He has died, and it seems the world goes on its way without even looking back for a single moment that the most intelligent man is no longer there. It will be difficult to find that sharpness and that intelligence again in centuries. But people are such sleep walkers, they have not taken much note. In newspapers, just in small corners where nobody reads, his death is declared. And it seems that a ninety-year-old man who has been continuously speaking for almost seventy years, moving around the world, trying to help people to get unconditioned, trying to help people to become free—nobody seems even to pay a tribute to the man who has worked the hardest in the whole of history for man’s freedom, for man’s dignity. I don’t feel sorry for his death. His death is beautiful; he has attained all that life is capable to give. But I certainly feel sorry for the whole world. It goes on missing its greatest flights of consciousnesses, its highest peaks, its brightest stars. It is too much concerned with trivia. I feel such a deep affinity with Krishnamurti that even to talk of connection is not right; connection is possible only between two things which are separate. I feel almost a oneness with him. In spite of all his criticisms, in spite of all my criticisms—which were just joking with the old man, provoking the old man…and he was very easily provoked…. Only on that point am I in absolute disagreement with him; otherwise, he was a genius. He has penetrated as deeply as possible into every dimension of man’s spirituality, but it is all like a desert, tiring. I would like you back in the garden of Eden, innocent, not serious, but like small children playing. This whole existence is playful. This whole existence is full of humor; you just need the sense of humor and you will be surprised…. But you will be surprised to know—whatever he was saying was against religions, was against politics, was against the status quo, was against the whole past, yet nobody was condemning him for the simple reason that he was ineffective. There was no reason to take note of him…. Krishnamurti failed because he could not touch the human heart; he could only reach the human head. The heart needs some different approaches. This is where I have differed with him all my life: unless the human heart is reached, you can go on repeating parrot-like, beautiful words—they don’t mean anything. Whatever Krishnamurti was saying is true, but he could not manage to relate it to your heart. In other words, what I am saying is that J. Krishnamurti was a great philosopher but he could not become a master. He could not help people, prepare people for a new life, a new orientation. But still I love him, because amongst the philosophers he comes the closest to the mystic way of life. He himself avoided the mystic way, bypassed it, and that is the reason for his failure. But he is the only one amongst the modern contemporary thinkers who comes very close, almost on the boundary line of mysticism, and stops there. Perhaps he’s afraid that if he talks about mysticism people will start falling into old patterns, old traditions, old philosophies of mysticism. That fear prevents him from entering. But that fear also prevents other people from entering into the mysteries of life…. I have met thousands of Krishnamurti people—because anybody who has been interested in Krishnamurti sooner or later is bound to find his way towards me, because where Krishnamurti leaves them, I can take their hand and lead them into the innermost shrine of truth. You can say my connection with Krishnamurti is that Krishnamurti has prepared the ground for me. He has prepared people intellectually for me; now it is my work to take those people deeper than intellect, to the heart; and deeper than the heart, to the being. 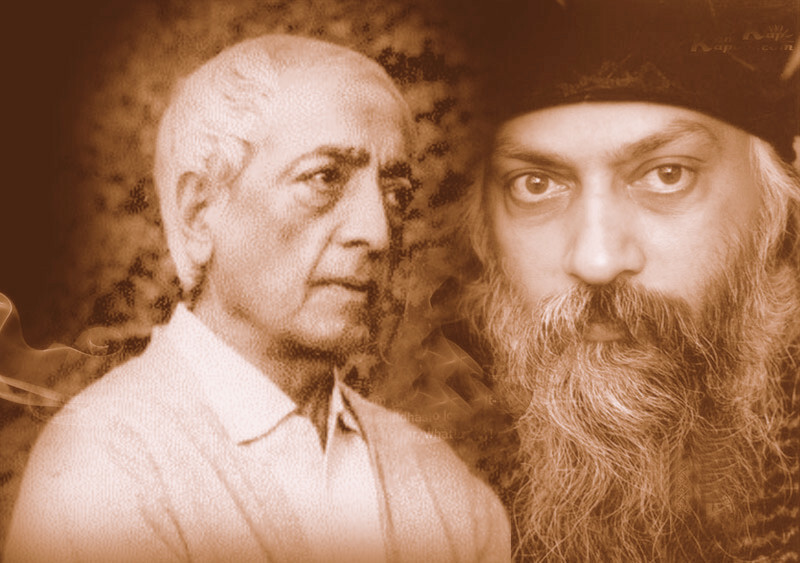 What Osho said about J Krishnamurti and his work on his death.